Most people know that hardwood floors are beautiful, but did you know that there are many different types of wood flooring to choose from? Engineered or solid? Prefinished or unfinished? Maple, oak or pine? That’s right, when it comes to hardwood flooring, the options are endless. Although all hardwood flooring is beneficial in a number of ways, and it’s always a great investment, in order to get the most out of your flooring, you need to find the right type for your needs. 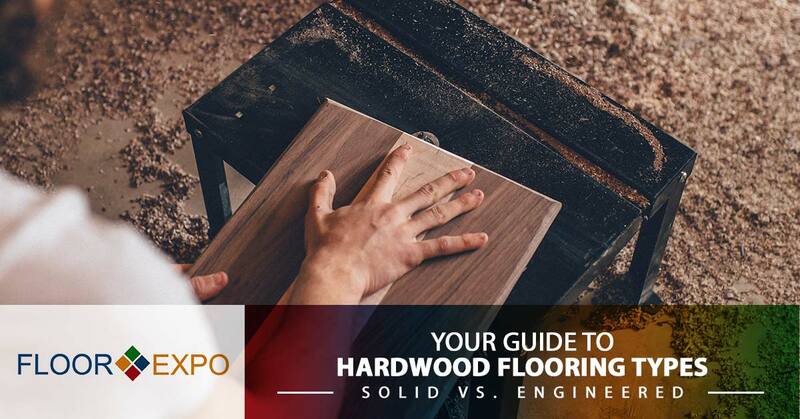 That’s why the expert hardwood flooring installers at Floor Expo have come up with this guide on the many different hardwood flooring types. Today, in Part 1, we’re covering the differences between solid and engineered hardwood. Solid – Solid hardwood flooring is just what it sounds like, wall-to-wall, solid hardwood. Engineered – Engineered hardwood floors are made from layers of thinly sliced hardwood laid over a base of top-quality plywood. What is the thickness and plank width? Solid – The standard width for solid hardwood is about ¾ inches, and you can get planks as thin as five inches and as wide as 10 inches. Engineered – Just like with solid hardwood, engineered hardwood planks start at five inches wide, and they’re usually ⅜ to ½ inch thick. Is it available prefinished or unfinished? Solid – You can get both prefinished and unfinished solid hardwood floors. Prefinished hardwood is, by far, the more popular choice, but around a quarter of all solid hardwood floor installations are unfinished. Engineered – The vast majority of engineered hardwood floors are prefinished, and very few floor installers provide unfinished engineered hardwood, so it can be difficult to find. Solid – As long as you maintain solid hardwood floors properly, they can last for years and years, and they’re incredibly durable. Engineered – Engineered wood floors are thinner and, therefore, less able to withstand chipping and delamination from too much stress. Can it stand up to moisture? Solid – One big downside to solid hardwood is that it doesn’t stand up that well to moisture. However, the top layer of unfinished solid hardwood is sealed, which makes it slightly better able to withstand moisture than prefinished solid hardwood, but it’s still probably best avoided in areas with a lot of moisture. Engineered – Because of the plywood base, engineered wood floors are much less prone to warping and flexing when exposed to moisture. The fibers in the plywood base run cross-wise, rather than the parallel fibers in solid hardwood. This is another reason why the plywood base makes engineered hardwood a better option for areas with more moisture, but it still shouldn’t be your first choice for bathrooms. Which wood species is it available in? Solid – In terms of wood species, there are many more choices available among solid hardwood floors. These choices range from the hardest species, like Brazilian Walnut, to some of the softest species, like Douglas Fir. Engineered – There are far fewer species choices available among engineered wood floors. You won’t find any softwood species in engineered hardwood. Some of the most popular species include hickory, red oak and Brazilian Cherry. Solid – One of the biggest benefits of solid hardwood is that it can be refinished time and time again, erasing scratches and other imperfections and making it look like new again. However, eventually, even solid hardwood will become too thin to refinish and will need to be replaced. Engineered – In general, engineered hardwood floors can be refinished once or twice. However, if the wear layer of engineered hardwood is thicker, you may get away with doing it one or two more times, but if it’s thinner, refinishing may not be possible more than once. Solid – Solid hardwood is installed by stapling or nailing it down. You cannot install solid hardwood on a floating basis — which means locking individual boards together without locking them to the subfloor. 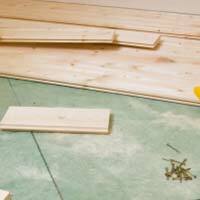 Engineered – Installing engineered hardwood is a lot easier than solid, because you can use many more methods to install it. These methods include gluing, clicking, nailing and stapling. Also, engineered hardwood can be installed on a floating basis. Solid – You never want to install solid hardwood floors below grade, so avoid it in basements. Solid hardwood is ideal in living rooms, hallways, dining rooms and bedrooms. Because they aren’t super resistant to moisture, use in bathrooms and kitchens isn’t ideal. However, with waterproof mats near the dishwasher, sink and refrigerator, it can work in kitchens, and with similar precautions, it’s okay for powder rooms as well. Engineered – Engineered wood floors can be installed in all of the same places as solid hardwood, plus below grade areas with the right subfloor. However, if moisture is a problem, avoid installing it in basements as well. For the right hardwood flooring solution for your needs, choose Floor Expo. Now that you know the differences between solid hardwood and engineered hardwood, stay tuned for Part 2 of Your Guide to Hardwood Flooring Types to learn the pros and cons of each. In the meantime, if you have questions or concerns about which option is right for your needs, or you’re ready to start checking out our available solid and engineered flooring options, give us a call! We offer free design consultations, and our professionals can help you find an option that works best for your needs and your budget. Alternatively, stop by our flooring showroom in Fairfield to see our inventory in person.